RV Solar Power | Ever Wondered How It Works? 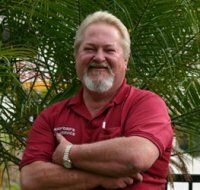 How Does RV Solar Power Work? RV solar panels use the virtually endless energy provided by the sun and turn it into power you can use. RV Solar power is generated using the same scientific principles to create electricity as the solar power generated to power a home or office building. The process used to create electricity is relatively simple and quite ingenious. You will need somewhat of a basic understanding of some chemistry principles, so do your best to remember what you learned back in high school and I will try to explain how RV solar power works. Let's first go over some of the chemical properties of an atom. Specifically we will take a look at silicon, the 14th element on the periodical table, because this is the element typically used in a solar cell. Silicon is normally comprised of four outer shell or valiance electrons. It can hold as much as eight electrons in its outer layer. When two silicon atoms run into each other they create a strong bond. This bond is neutral because of this new balance of eight electrons. However, because of this neutrality we can't use this to create electricity. We need to have a way to make a negative charge and a positive charge so we can create electricity. If we go back to our high school chemistry days we might remember that if we have an extra electron in a bond it is considered negatively charged. We also know that if a bond is missing an electron it is positively charged. So if we take silicon, which has four electrons, and Phosphorus, which has five, we now have nine electrons. This bond is now negatively charged. This negatively charged silicon is known as N-type silicon. Additionally, if we take silicon with its four electrons and boron, which has three, we have seven electrons, a positive charge. This is known as P-type silicon. These combinations of bonds are made into tiny metal plates and put on opposite sides of a solar cell. This area in a solar cell is called a P-N junction. Now we have a platform to have a transfer of energy, but we need a little help from the sun to complete the transfer. The sun gives off a massive amount of energy in the form of particles. The one specific particle we are interested in for our RV solar power is called a photon. When a photon is thrown at the unbalanced system of positively and negatively charged bonds, it knocks loose the extra 9th electron and is transferred to the open spot to be the 8th electron on the other side. This creates a small amount of electricity in the form of a direct current. 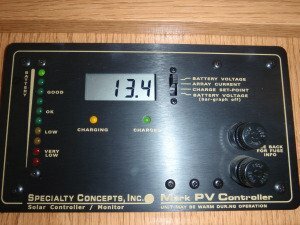 The charge controller on an RV running on solar power displays its battery voltage. This process is repeated over and over in a single cell. One solar cell is capable of producing about .5 volts, although it rarely reaches its full capability. An RV solar panel can have anywhere from 36-44 cells on average; however, you can have more or less. This can produce anywhere from 16-22 volts of beautiful RV solar power on a sunny day. Keep in mind that your batteries are 12 volt, so this is typically enough to sustain 1-4 people. The process of a working RV solar panel is complex yet somewhat elegantly simple. Understanding how a solar panel works might not aid much in the decision of whether to purchase one or not, but sometimes it is nice to understand and respect the science of how things work around us.